It is simple. Look at this photo of a dog and cat and write a caption/speech bubble/thought bubble or anything else that captures your imagination. I told you I could fit your head in my mouth. 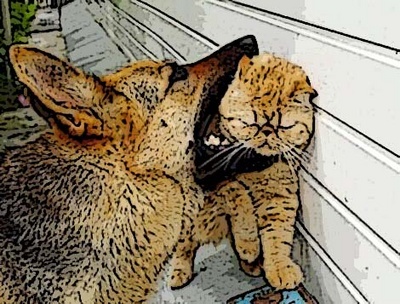 Rex couldn't get to grips with this new cat-shaped dental floss. FLuffy, Now We can do this the easy way, or the hard way. Where the heck did you put my bone?